Disconnect the electrical connections from the fuelinjectors-(1). Note:Support the fuel rail along the bottom, indicated by thearrow. 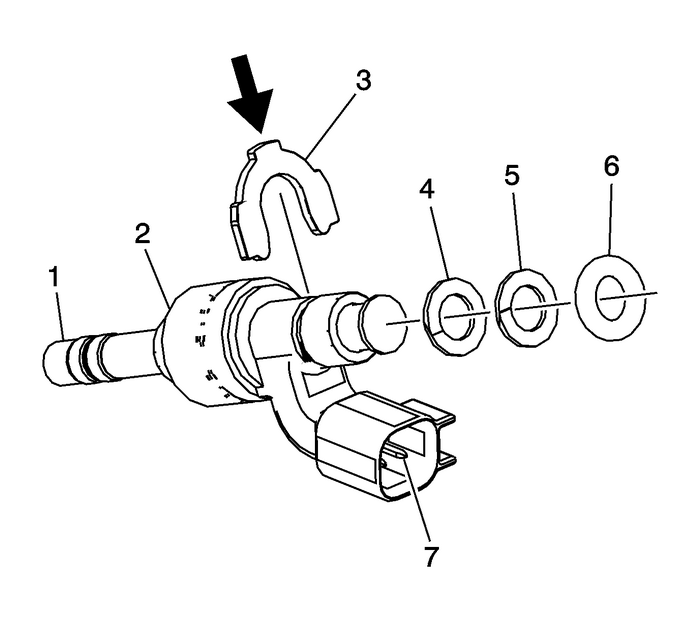 Support the fuel injector at the widest point, indicated bythe arrow. 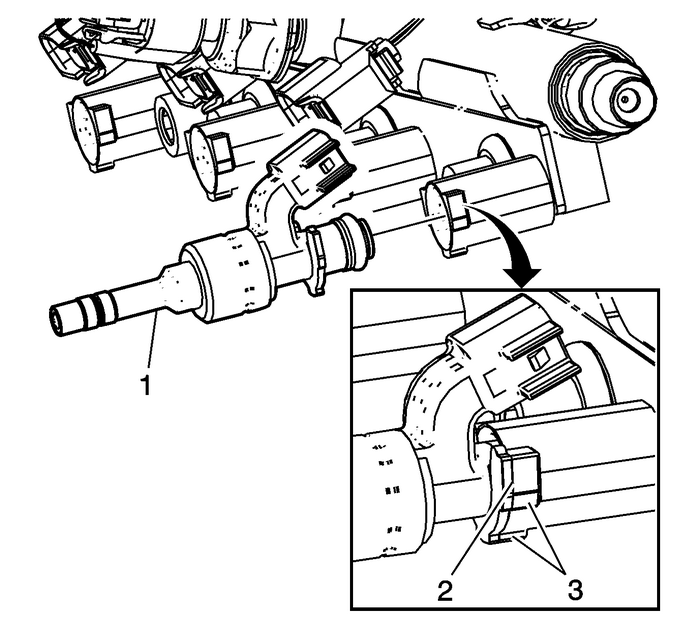 DO NOT support or hold the fuel injector by the tip orconnector when removing the fuel injector retainer. Remove and discard the fuel injectorretainer-(2). 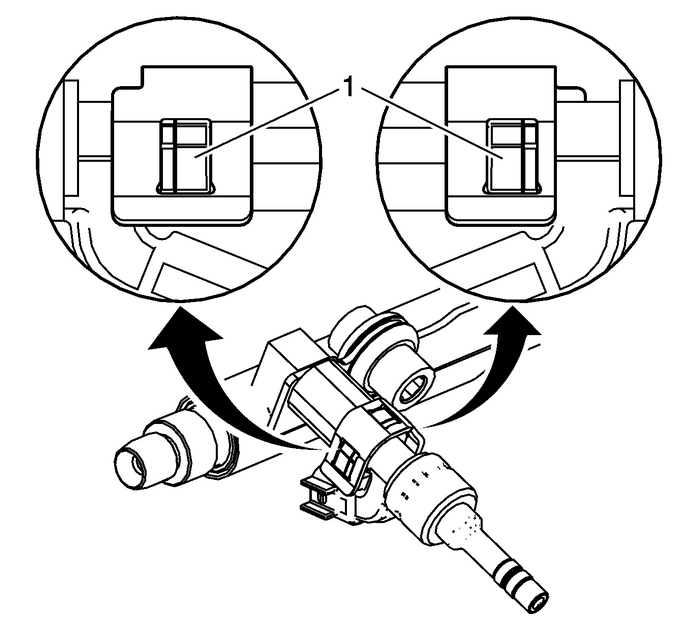 Note:Support the fuel injector at the widest point, indicated bythe arrow. Support the fuel rail at the point indicated by thearrow. 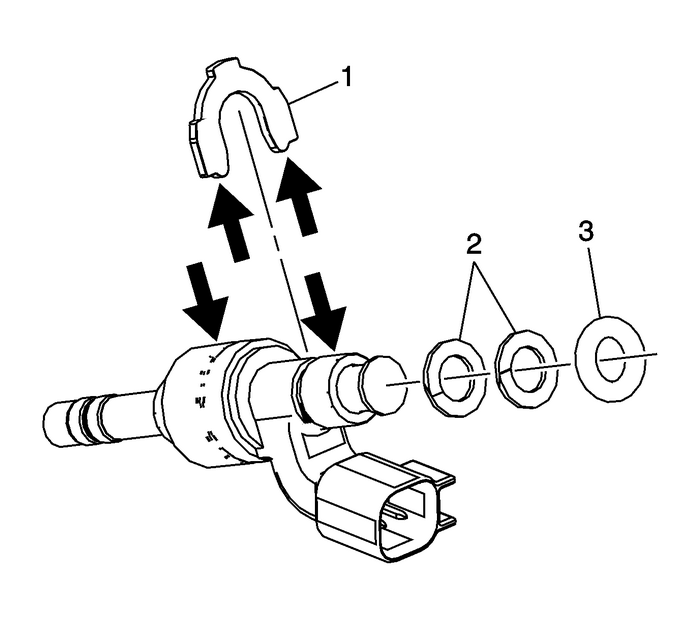 DO NOT support or hold the fuel injector by the tip orconnectorDO NOT tilt or excessively twist the injector duringremovalRemove the injectors-(1) from the fuel rail bypulling straight out along the fuel injector axis. Slight rotationof the fuel injector is acceptable. 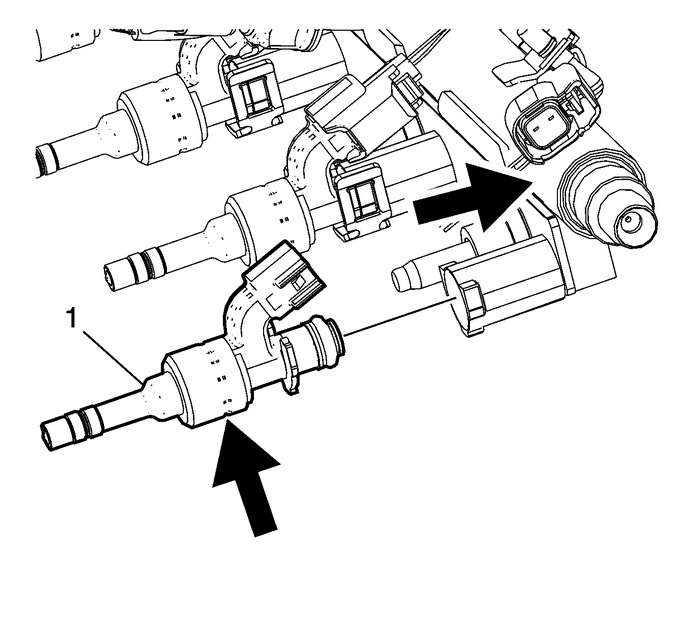 Note:Support the fuel injector at the widest point, and directlybehind the bushing location, indicated by the arrows. 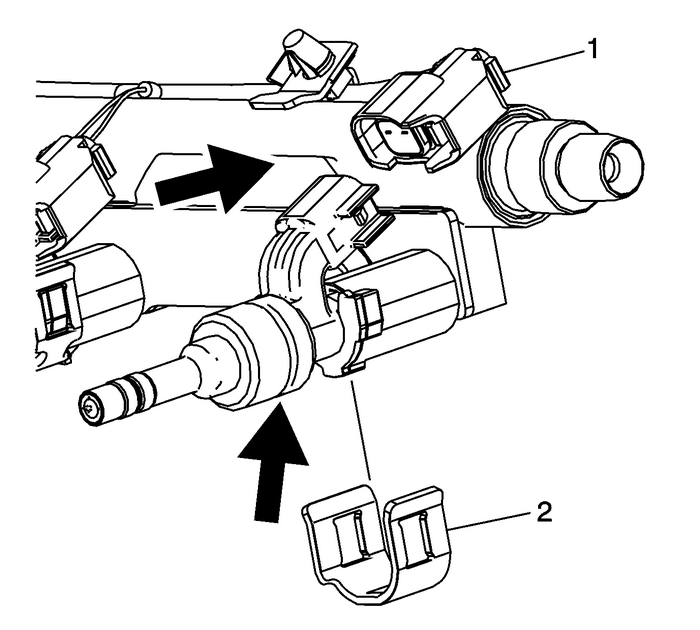 DO NOTsupport or hold the fuel injector by the tip or connector whenremoving the fuel injector bushing. 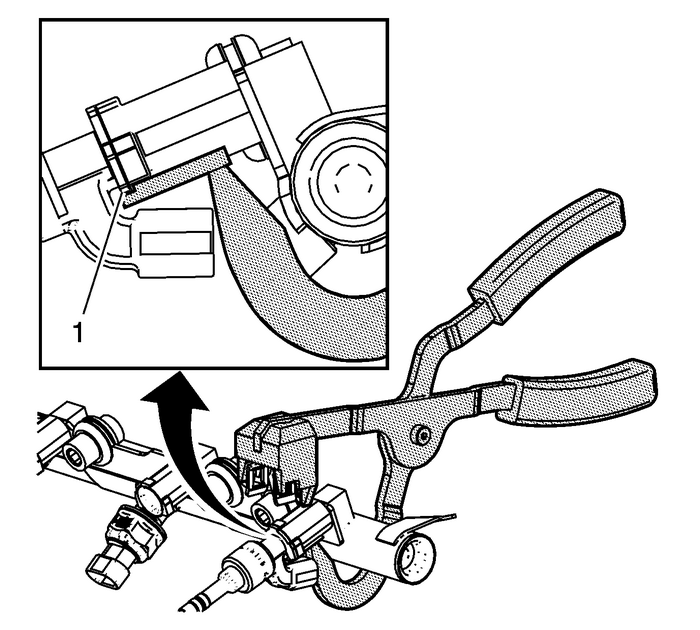 Using a suitable tool, remove the fuel injectorbushing-(1) by pushing straight off at the bushing tabs,indicated by the arrows. Discard the bushing.Remove and discard the fuel injectorO-ring-(3) and plasticspacers-(2). Remove and discard the fuel injectorseals-(1). Note:Do not soak or submerge the fuel rail or injectors insolvent. Clean the exterior of the fuel rail-(1) andinjectors in solvent.Inspect the fuel rail and components for the followingconditions:Damage, debris, or restrictions to the fuel railDamage, debris, or restrictions to the fuel ports in the fuelrailDamage to the mounting area for the fuel railDamage to the fuel rail mounting boltsDamage to the threads on the fuel rail fuel feedfittingReplace the fuel rail if any damage is found. Do not attemptto repair a fuel rail. 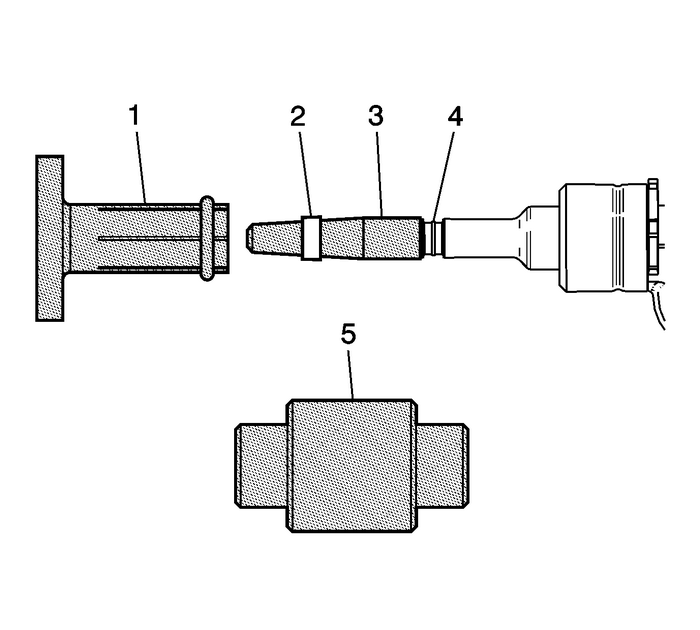 Inspect the fuel pressure sensor-(3) fordamage.Disconnect the harness connector-(2) from the fuelpressure sensor.Remove the fuel pressure sensor. Dry the fuel pressure sensorbore in the fuel rail with a lint free cloth. The bore should befree of fuel, debris, and burrs.Lubricate the fuel rail fuel pressure sensor bore with cleanengine oil.Lubricate the threads and sealing area on the fuel pressuresensor with clean engine oil.Install the fuel pressure sensor hand tight.Remove the fuel pressure sensor and re-lubricate the bore,threads, and sealing area.Install the fuel pressure sensor and tighten to33-Y(25-lb-ft).Connect the harness connector to the fuel pressuresensor. 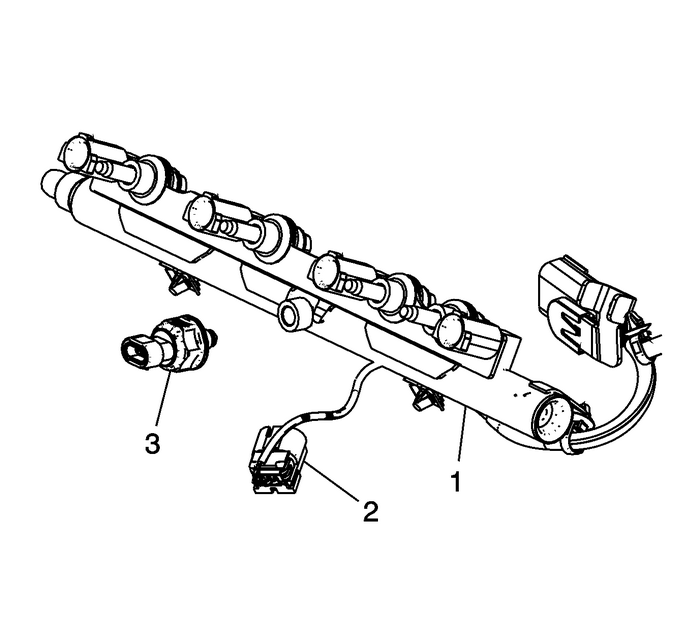 Inspect the fuel injectors for the followingconditions:Damage to the fuel injector connector-(7)Damage to the fuel injector harness connectorDamage to the fuel injector tip-(1)Damage to the tolerance ring-(2)Replace the fuel injector if any damage is found. Do notattempt to repair a fuel injector.Install a new fuel injector bushing-(3) onto thefuel injector. The bushing should seat with a distinct“snap” sound and feel. Note:DO NOT reverse the order of the plastic spacers. Identify thecorrect order in which the new plastic spacers are installed by thecolor of the spacer. Install the new white plastic spacer-(4) on thefuel injector first.Install the new brown plastic spacer-(5)second.Lubricate the new O-ring-(6) with 5W30engine oil.Install the O-ring on the injector. 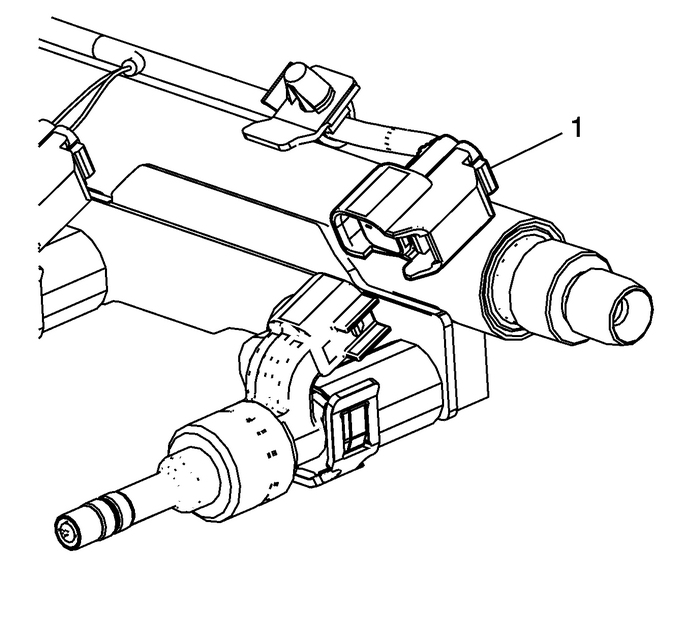 Note:The injector must be fully installed and properly alignedwith the fuel rail in order to install the retainer. Note:Ensure the retainer is set properly intoEN-49247installer. 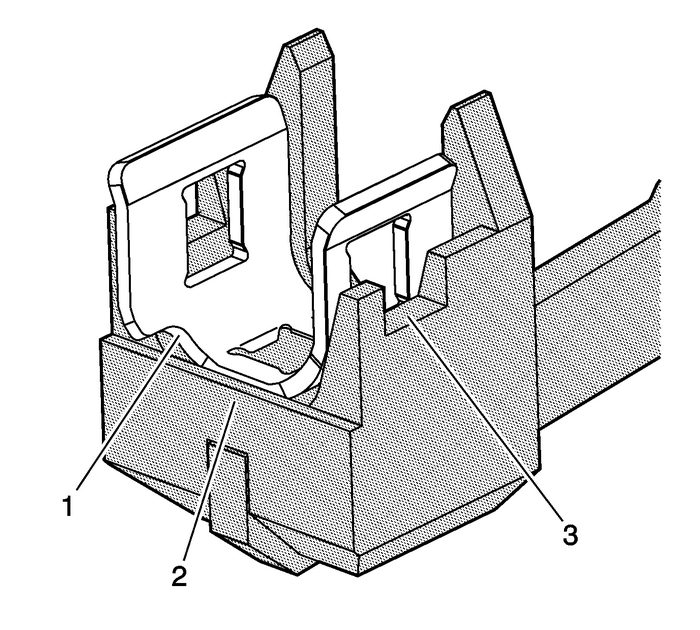 The notch should always face forward-(1)The retainer should be behind the plate-(2)The tool windows allow for visualalignment-(3)Install the fuel injector retainer onto theEN-49247installer. Note:Ensure the tool is resting on the flange of the injectorbushing-(1). UsingEN-49247installer, install the fuel injector retainer. Caution:Ensure the fuel injector retainer is properly installed.Failure to completely install the retainers may degrade fuelinjection system performance or cause system malfunction. Inspect each installed fuel injector retainer, and ensure theretainer is fully seated on the fuel rail and fuel injector bushingflanges-(1). The flanges on each side and at the top ofthe fuel injector should seat completely into the window on theretainer. Connect the electrical connection to the fuel rail.Connect the fuel rail harness connectors-(1) tothe fuel injectors. Note:Do not use any type of lubricant when installing the NEWseals-(2) on the fuel injector tip. InstallEN-49245-1long protector-(3) onto the fuel injector tip, covering thefirst recessed area closest to the tip. 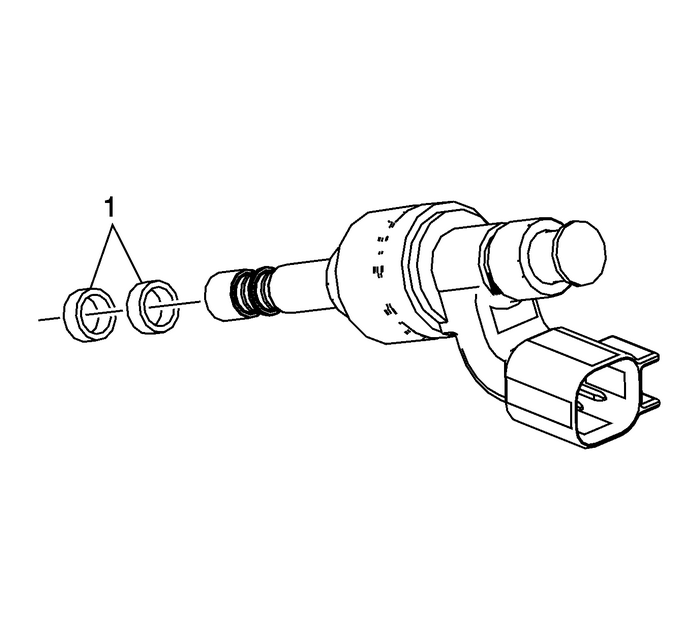 Place a NEWseal-(2) onEN-49245-1long protector.UsingEN-49245-3pusher-(1), install the seal into the second recessedarea-(4) of the fuel injector. Note:TheEN-49245-4sizeris two sided, and either direction will size the sealcorrectly. Compress the seal with your fingers, then resize the sealusing theEN-49245-4sizer-(5). InstallEN-49245-2short protector-(3) onto the fuel injector tip. 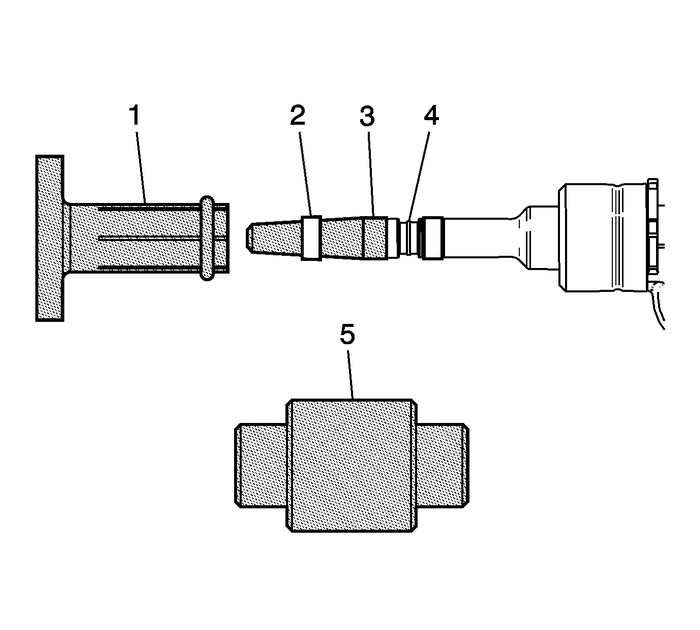 Place a NEWseal-(2) onEN-49245-2short protector.UsingEN-49245-3pusher-(1), install the seal into the first recessedarea-(4) of the fuel injector.